Why did we make the Pancake Recipe Calculator? 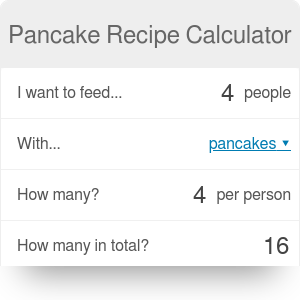 What did we use to create the Pancake Recipe Calculator? Apart from PB&J and oatmeal, pancakes are the most popular (and best) breakfast meal. They’re nutritious, yummy and can be served with both salty and sweet flavors. But are they easy to make? The recipe may be simple, but there are many things we need to consider. And this easy Pancake Recipe Calculator will help you make the best pancakes in your household. Have you ever wondered how many pancakes you’ll make with your tiny (or enormous) pan? Or maybe you opened your fridge, found out you have just 3 eggs and asked yourself how much flour and milk you need to make proper pancakes? Or you just wanted to make pancakes for you and your four friends and didn’t know how much of ingredients you need? If you have those problems, Pancake Recipe Calculator is for all of you. To make pancakes, you need flour, milk, and eggs, some salt, oil and baking powder. You skip the last one if you just settle on crêpes. But how much, really? It all depends on your and your friends' hunger and your pan size. To use our calculator, just type the number of people that will eat your pancakes, how many each one will eat and (for crêpes) your pan diameter. You’ll get your ingredients and the recipe for perfect pancakes. The Pancake Recipe Calculator works both ways, so if you want to find out how many pancakes can you make with the resources available, just type one ingredient (e.g. eggs), how many people will eat your pancakes and then you’ll get the full recipe. Voila! It’s simple as that. We always had problems with pancakes. As it often is, the simplest things are hardest to do. Many things can go wrong along the way. Add too much flour, and you won’t have those fresh pancakes that you need in the morning. Same thing with does with eggs and milk. Forget about the oil and they will stick to the pan. Make them in too small pan and it will take you few tries to find the perfect pancake batter amount. All those problems boil down to this: we need everything perfectly calculated to make perfect pancakes. Good thing we’re in the calculator-making business, right? We had those problems constantly, and we know that many people have them too. So we deconstructed the easy pancake recipe we found on Jamie Oliver’s website and created the best formula to calculate everything you need to know when making pancakes. The additional ingredients, your peanut butter, jam, fruits, maple syrup and all sorts, they are up to you. Some want pancakes just dripping with sauces and syrups; some think minimalism is the right answer and use everything very moderately. But pancakes, they need to be perfect, right? Even the sweetest syrups won’t cover bad pancakes. We used recipes created by famous British cook Jamie Oliver. He used metric system units (grams and milliliters), but we’re using cups as the main unit for flour and milk. Not everybody has scales, right? But if you’re from continental Europe or Canada, feel free to change to your preferred units. Our Pancake Recipe Calculator works for both pancakes and crêpes, so we used two of Oliver’s recipes. Pancakes and crêpes are different, after all. Pancakes are more popular in the USA; they’re closer to proper cakes, they’re puffy and look glorious when stacked. People mostly eat them with maple syrup, but there are places where you can get them served with Nutella, fruits, and marshmallows. Just imagine this carbs bomb. Crêpes are French through and through; they’re light, sophisticated and very European. Most people eat them with jam, peanut butter, fruits, but also cottage cheese or meat (in the lunch version). Here’s the Jamie Oliver’s recipe for pancakes, and here’s the recipe for crêpes. Update 20.06.2018 by Matt: I've used the calculator to create crepes at least 20x so far and always had to add more milk. I tried adding exactly 40% more milk during the last few times and it was always perfect. From now on the calculator recommends 40% more milk. The main difference in recipes is that you need more flour and, especially, milk (almost twice as much) when making crepes. You can find the difference when you type the number of eggs you want to use and check how different will the ingredients list be. Short story: because they’re delicious. But pancakes are so good that we need to say exactly why. Some dishes are destined to be made with your friends and family. There are burger evenings, sushi nights and there are pancake mornings. There are not many things that can break the ice between people in a workplace or between flatmates than making pancakes for breakfast. Everyone can do their particular job. One can be in charge of separating the whites from the yolk. Another can measure the flour and milk. Then, somebody else can mix the batter. Finally, there will be someone in charge of frying them in a pan with a specialist (think a kicker in the NFL) in tossing the pancakes coming to your help. You can tell your favorite pancake stories, the way your mum made them or your pancake record (everybody has their personal best, right)? And then comes the best part: you get to eat pancakes. Pancakes are a great way to fight bad mood. They usually have this incredibly warm color that immediately makes you upbeat. Plus, they are delicious in almost any combination, and, as we know, tasty food boost your endorphins. Especially if you mix them with dark chocolate, which also kicks your mood. But if you always look on the pragmatic side of things, then we have to talk about nutrition. Pancakes and breakfast go hand in hand mostly because they are the perfect first meal of the day. They have lots of carbs and calories, so they are immediately ready to be transformed into energy in your belly. If you make pancakes the cornerstone of your breakfast, then you should have enough energy to get through the day until lunch. And guess what, get some meat and vegetables, and you can have delicious crêpes for lunch. Our pancake recipe calculator is doing nothing but solving proportions. In fact, each recipe consists of a certain proportion of ingredients. If there is too much of an ingredient, the final product will be faulty (e.g., too salty if we put in more salt than it is written in recipe). The same thing will happen if we put in not enough. We have changed this pancake recipe as, in our opinion, the amount of milk in the original recipe was too low. We can also use proportions to calculate the necessary amount of ingredients when we prepare more (or less) portions than in the recipe. Learn how to do it by visiting our proportion calculator! Pancake Recipe Calculator can be embedded on your website to enrich the content you wrote and make it easier for your visitors to understand your message.